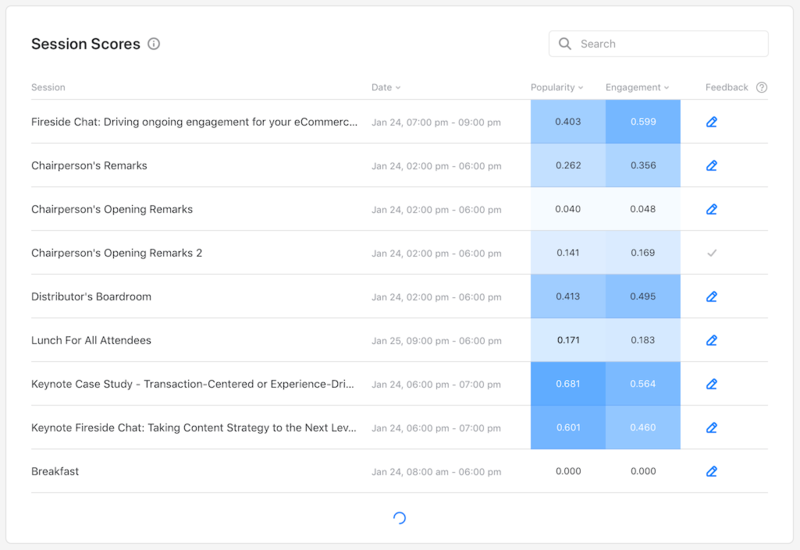 Learn about our Session Insights feature to measure user engagement with the event Schedule. Every event is unique, but all event planners and marketers want more insights into what attendees truly found interesting and engaging. 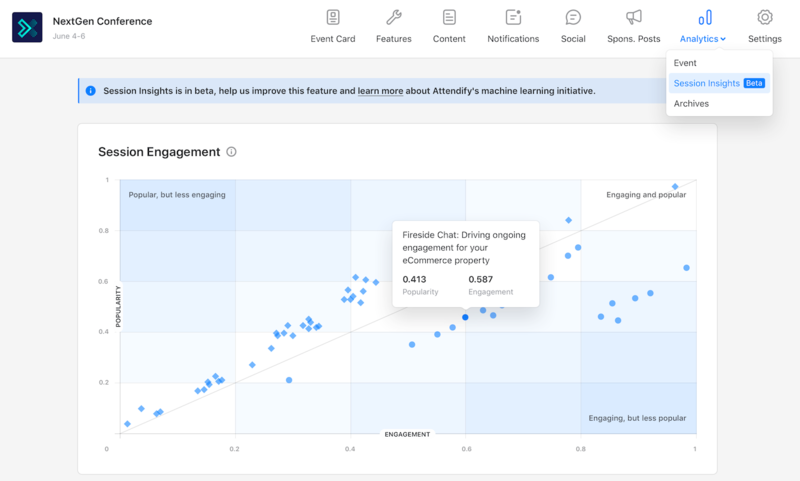 Attendify’s Session Insights feature uses the vast amounts of data we collect as attendees use your app and synthesizes it into insights that you can put to work. We track and calculate engagement based on attributes unique for your event. And the Session Engagement chart visually represents which sessions your attendees found more or less engaging relative to their popularity. The chart is organized with popularity on the y-axis and engagement on the x-axis. Most of your sessions will fall along the central line, which is expected. But whenever you see the deviation from the central line, that's where you're most likely to identify the insights. For example, if a session was popular because it was promoted at the event, but engagement was low then that topic may not be of interest, or that speaker didn’t connect with the audience. These signals help you investigate further and get to the bottom of what’s really going on. Conversely, if a session was not popular, but engaged your attendees you may want to investigate and see if that’s a topic you want to focus on more next year, or a speaker that’s worth inviting back. The key here is that Attendify is looking for connections in a vast trove of data that would otherwise be overlooked. They won’t always be meaningful, but they are useful as a compass to guide you towards potentially valuable insights that can help improve your event. Session scores compliment the chart and provide you with a numerical representation of your sessions popularity relative to engagement. Popularity score will give you an insight into which sessions were mostly viewed by the users but weren't really interacted with. Engagement score is calculated based on the number of user interactions with the session (factors include, favorites, notes, document downloads, speaker views, and much, much more) relative to the number of Views. Our scoring models are designed to evolve and improve over time and your feedback is essential to that process. Give us a quick Thumbs up if you agree with the assessment our system has provided. 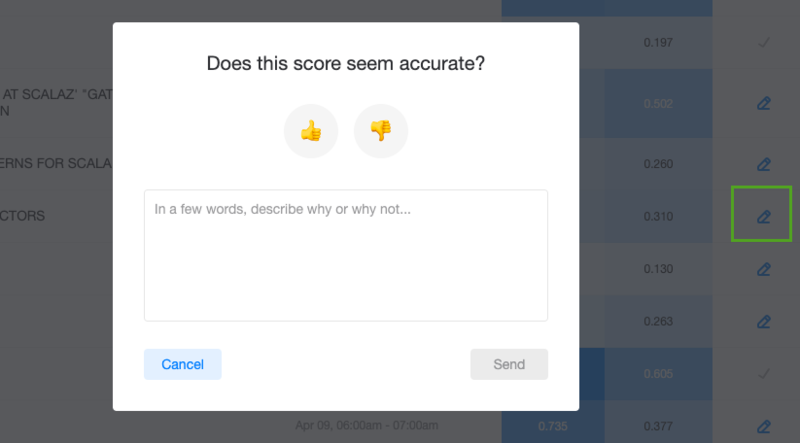 If you see a score that doesn’t make sense, tell us why and share some context.